So, one more time, just to document that there are still PLENTY of financial yakkity yaks who are STILL bearish the market, here is another collection of very recent headlines, all of which are essentially telling you, “SELL NOW!” And to be clear, I continue to think they are all just dead, dead wrong. The truth is, since I entered this business in August, 1980, I literally cannot count the 1000’s of “intelligent” but ultimately useless reasons I have seen to short the stock market. Of course, during these past 37 years there have been times when the stock market did go down, but generally speaking, we know what the eventual result has been…that being the Dow has rallied from a low of 769 in 1982 to its current almost 23,000 level. What I’m trying to convey is that whether it be “fear” gauges (like VIX), or PE comparisons, or the Kondratieff Wave (in the early 1990’s that was a big, very CONVINCING, but WRONG, argument), or Elliot Wave nonsense, or Banks collapsing, or Pension Funds collapsing, or terrorist attacks, tsunamis, or election results, or a LONG list of countries and/or geographical areas supposedly collapsing (Mexico, South America, Southeast Asia, China, Japan, Europe, Great Britain, etc…), or simply because the market has been “going up for too many years”, they have ALL been proposed as reasons for the markets and the economy to fall apart…Whether it was any of those or a slew of other reasons, like I said, there have been 1000’s of calls for the Stock Market to die, some of which I myself wrongly found compelling (in my early years) since I got into this business…and virtually none of them have been correct. For something like 20 years I have been of the opinion that there are two major NEW themes…One, the still exploding Technology Revolution. And two, the Collapse of Communism and ensuing worldwide conversion to Capitalism…Both of which have been dominating this planet from an economic perspective, representing a combination of forces that no classic economic forecasting models could have possibly been able to account for…as neither of those “forces” had ever existed until approximately the late 1980’s. And when you now ALSO throw in to the mix the lowest interest rates in Modern History, I maintain that virtually ALL the theoretical measures of what is “supposed” to happen become even less valid…even further off the mark….and especially those that call for the USA and global economies to turn southward…For sure, SOME day we will reach a point of overreach and business excesses, but I simply believe we are a LONG way from seeing that happen. I remain convinced that we are going to see some INCREDIBLE economic numbers and blow-your-socks-off growth…and will therefore reiterate that I expect to see the Stock Market continue higher… and it will do so until ALL of the “Don’t buy it here” voices become TOTALLY silenced. Believe me…That chart would NOT be where it is if business was to STRONG. Like I’ve said, this thing obviously will stop somewhere…and then probably go sideways for a long time…but I don’t think we are anywhere close to that point. I am of the firm opinion that NONE of the Fed’s actions so far has done ANYTHING to eventually slow this economy…Or putting it another way, the fact that the Fed has brought rates up to 1.25% has effectively had ZERO effect on the future plans of any business you want to name…I mean, really, do you think it makes any difference to any corporation, like Microsoft, or Boeing, or Chevron…or any company you want to name, that rates have gone from .5% up to 1.25%? I sure don’t…And you’d better believe that the Fed that WILL end up having to SLOW things down…WILL end up in a position where they DO have to curtail spending, expansion, construction and speculation, etc...AND, I would add, the Stock Market. And with this future reality in mind, it is therefore also important to understand that whatever actions the Fed takes to raise rates will not have any real impact for easily 9 months to a year…which is precisely why the Fed always has to be a year or two ahead of what the economy is actually doing…or more specifically, why they can’t wait to SEE conditions or inflation get too hot…which is precisely why I keep pointing out that there is not a single Fed governor who ever thought the Dow…a barometer of the FUTURE…would even be anywhere near even 19,000-20,000…much less pushing 23,000. PERIOD. They did NOT. Not a single one of them. And so I’m going to repeat it for the umpteenth time: THE FED IS ALREADY BEHIND THE CURVE, AND I EXPECT THE CONTINUING “STONGER THAN ANALYSTS EXPECTED” ECONOMIC NEWS WE ARE NOW SEEING TO RESULT IN THEIR IMMINENTLY HAVING TO START PLAYING SOME SERIOUS CATCH UP…AND WITH THE FINANCIAL MARKETS STILL REFLECTING VERY SLIGHT INCREASES IN RATES FOR THE COMING YEAR, I STILL BELIEVE THAT THERE IS AN ENORMOUS TRADE TO BE MADE IN EURODOLLAR PUTS OUT INTO THE MIDDLE AND LATTER PART OF 2018. For the record, here is a summation of how it worked during the last Fed rate raising campaign (when they also found themselves having to move much faster and bigger than they originally anticipated): They started in June, 2004…And 6 months later rates were up 1.25%...During the next 12 months, rates rose another 2.00%...And finally, during the next 6 months, rates rose another 1.00%. Right now, the Eurodollar market has LESS than a 1/2% increase built in out into next September…fully 11 months away…and I believe that ABSOLUTELY will change in a MAJOR way between now and then. Just because this market has only meandered lower does NOT mean it will be that way going forward…And do be aware that, as noted on the first chart, Eurodollars DO often make quite direct 50-100 point moves in just a month or two… Markets do not just operate at a single speed. Sometimes they are sideways. Sometimes they are grinding…And sometimes they are in HIGH GEAR. And yes, one more time…And I am beating this to death but NOBODY at the Fed believed that stocks would be anywhere even close to where they actually are…and I say that EVERYBODY at the Fed is about to be further surprised to see the Stock Market starting to go REALLY nuts on the upside…And they WILL, together with what the economy is also heatedly showing them, almost overnight start pushing rates MUCH harder than they have been. And no…I don’t know how much rates will be up a year from now…by next September…but I think it will DEFINITELY be much more than all the Wall Street analysts, and the markets and investors they influence, are even close to indicating…I have seen this script many times before, especially in interest rates, where the whole world is thinking one way…and in the end, they are all proven to be incredibly wrong…After all, that IS the way the markets work. EVERYBODY gets on board with one big WRONG perception…and the they find themselves having to RUN in exactly the opposite direction…And this IS why big moves ARE routine in the futures markets. I continue to think the Lumber market is about to turn into an absolute ROCKET. Aside from my strong opinion that the economy is accelerating…which very much includes commercial and residential construction…and therefore was already providing a bullish influence to the price of the 2 x 4’s this contract represents, I also KNOW that NO ONE in the lumber business had counted on the massive destruction caused by Harvey, Irma…and then Maria…and the MONSTER need for building materials that will be involved in massive reconstructions that WILL take place. As noted months ago, the cheapest rates in modern history, Record World Demand, and a vigorously expanding GLOBAL economy should push Copper prices far beyond current levels…And same as with Lumber, hurricane damaged reconstructions were not in anybody’s supply-demand equation for this metal. And finally, Crude Oil…Same as Lumber and Copper, I think the bullish case was already there in this market...Here again we have Record World Demand and an solidly expanding WORLD economy…And then, adding to those two basic fundamentals, I think the news item shown below speaks volumes to the idea that Crude can only (in my opinion) be set up to move SIGNIFICANTLY HIGHER…This news got maybe a single day of play in the press. I THINK THIS WAS AN INCREDIBLY IMPORTANT EVENT. 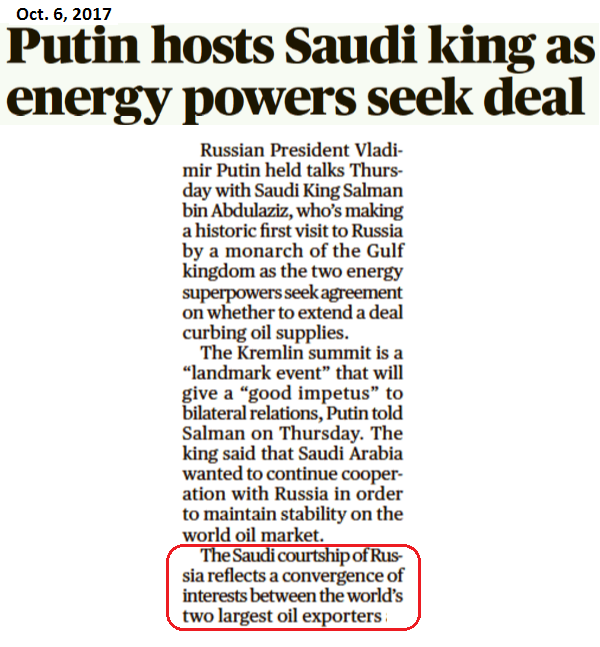 I would add that this was the first time, EVER, that a Saudi King has gone to Moscow…And to put it mildly, these guys, THE WORLD’S TWO LARGEST OIL EXPORTERS, were NOT getting together with intent of keeping prices low…I CONTINUE TO RECOMMEND BUYING THE CRUDE OIL MARKET. 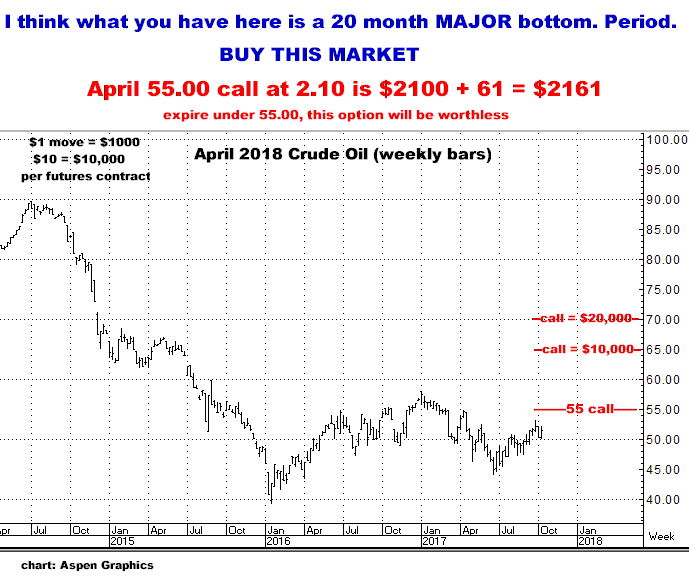 Great trade here…And if you think a move to $70.00…$18.00 from here…sounds like a lot, just be aware that Crude has had a $12.00 range during the past 20 months as it has been trading SIDEWAYS…And I say that to move $15, $20 or $25 from here woud just be NORMAL action for this market. And, one more time, if you HAVE been on the Eurodollar, and are now off of it, or now only have a “lite” position I strongly urge you to get something again in that market…Rates ARE going up…The nasty consolidation is ending…DON’T be in the “wish-I-had” crowd two or three months from now…I hate that…for you and for me.